•*All posts will be read, but each week will delete the posts so only that weeks info is topical. •Dragon Spawn and Turnins leave. •BG fix to make the randoming of sides work better. •HE Battle Manuals and HE Bubble Gum is in the Kafra shop for 2 weeks. •Following Kafra shop items are now Vendable, if used for an event they will be made account bound again before hand. •Mini Christmas Tree effect updated. Base effect is the 2% reset to various status effects and a very low chance of dropping Cookie Bag. +7 will multiply that chance by 3, +9 will multiply that drop chance by 5. So if you have it upgraded, it is quite nicer. •Okonlir Crystal Keys should be more able to be gathered by very high leveled killers. •Novice Training ground made easier for new players. You may not exit the training ground until you have reached level 11/10. The New Eden Group representative in the Training ground will let you choose your city. •Exp chunks for the training ground were re-evaluated to make sure the full exp amount is given to the Novice. •Next Week we have an EXP event, go to our Facebook page and like the post to add % to the exp event! •HD Elunium and HD Oridecon stop being sold in the Kafra shop. They will return in other forms and at later times. "Mighty Hammer" the smith that uses the HD Elunium and HD Oridecon will continue using them at +4 or better until February 3rd. After that they will require +7 or better gear to use them (by default). •Subtle additions to the Eden Group area, placing NPCs that convert "stuff" into consumables will be put in there, to assist new players. 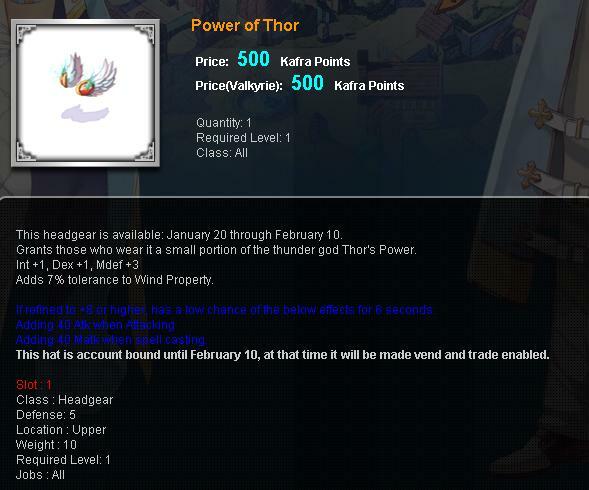 •Power of Thor is offered in the Kafra shop from January 20 - February 10. •Battle Grounds is getting a further attempt at Randomization. Hopefully we can get some feedback from players trying it out after maintenance. •Drop Penalty based on Level returns. •Special conversion event. Convert 1000 WP (or more) into Kafra points and we will give you a Rabbit Magic Hat on February 3rd 5pm through the "Code the Redeemer" NPC. 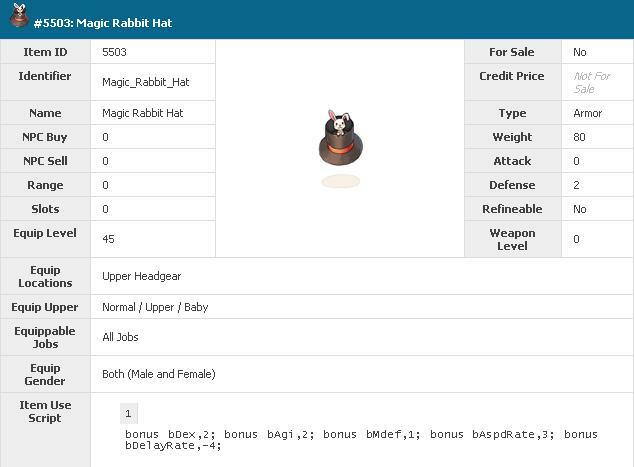 Accounts can earn multiple Rabbit Magic Hats via multiple conversions during this event period. •"Branch" items will spawn monsters in a more desirable way. •Crimson Rock will no longer hit party members. •BG will now random sides, we need to test this with more people to see how well load is taken with it. •Novus, Ferus, and Acidus hunt event will start. Eden Group can offer a warp if you have the Baby Dragon Hat. •Nidhoggur instance should have correct monsters spawning on the 2nd "floor"
•The Christmas "etc" items will become sellable to NPC, please do so to clear them from your inventory, we will later delete them for you. •Raphael the Raffler returns to Prontera! •The full resetter has left Midgard. If you are a returning or old character that wants to reset that 1 time for free, contact us through the Ticket system. •Glorious Fist is updated to remove the "fixed cast time" so a cast time still exists, which is shortened with dex. *We are leaving the Death and Drop penalties alone for 1 more week, we are doing a network change that has a chance to affect game play (for the better is the plan), so we want to be sure we are not penalizing game play. HD Elunium and HD Oridecon will stop being sold next week. So it is advised to do whatever upgrading you wish while they are available. Can't edit there. so here it is. Undeliverable Gift exchanger will stick around until "later"
Baby Dragon Hat will give bonus effects on the Petit Hunt quests in until 27th. Increase spawn of Ayothayan monsters. Bonus effect on quest with the Leaf Cat hat, more exp more count options, and bonus defense against Ayothayan monsters. Lava Golem Card will work on the "quest Bradium Golem" that it wasn't working on. Valkyrie: enter game directly will be disabled, training grounds becomes mandatory. The word filter is being updated, should help with the slow down in Valkyrie Towns. This does not mean it is ok to start swearing.. reports of rude speech will be processed normally. copyright © 2019 （影）葱道＠旧ろーど とぅー ちょいさー all rights reserved.